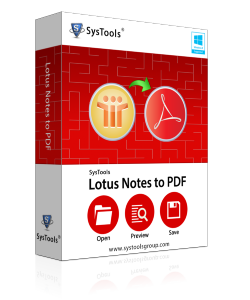 To convert and print Lotus Notes to PDF document, you are just a click away! Use NSF to PDF software. The tool exports emails and its associated attachments from nsf file (mail database, repli-cated and archived nsf file) of Lotus Notes and Domino Server. Compatible with all Versions of IBM Notes, Adobe Acrobat, Reader & Windows. Software for NSF to PDF Conversion will allow the bulk conversion of all Lotus Notes mails with attachments. Tool migrates default mail database file, replicated and archived NSF files. Software provides scanning procedure to transmit bug free data in PDF format. After Scan, user can preview the email details like item counts, Meta properties by selecting desired Email. Lotus Notes to PDF Converter preserves the entire internet header like CC, BCC, TO, subject, date, time, attachments, inline pictures, links, HTML format and all while conversion. Lotus Notes NSF to PDF tool maintains the nested Hierarchy of all mailbox folders like Inbox, sent items, Outbox, Draft and user defined folder while exporting into PDF Format. The data remain in same folder as it was in Notes platform. NSF to PDF converter is filled with enormous features like it would not compel you to convert en-tire mails in one PDF file. Software creates individual PDF file per emails folder wise. Software for Export Lotus Notes database to PDF is fully flexible with below versions of IBM Notes 9.0 and all earlier versions 8.5, 8.0 7.5, 7.0, 6.5, 6.0 etc. Suppose you are a lawyer, business users, administrators, software developers, attorney profession-als or doctors who comes with the situation where you need to access records of your client form his/her emails. Your client uses IBM Notes. As IBM Notes is system specific, so it is not possible for you access mails. Your client is not available now but you need to save Lotus Notes mails quickly. You need to save Lotus Notes email to PDF, so that you can maintain the data with confidence with you. The NSF to PDF converter tool supports converting IBM® Lotus Notes emails with attachments into standard PDF file format. To run this NSF to PDF conversion application, no prior training needed because software is completely user friendly. There is special arrangement for short demo video, which shows step-by-step process and shows you steps in the written form. Whether you need single mail data along with attachments or you need multiple data, select accordingly and print Lotus Notes document to PDF. The installation is simple and quick which leads to convert bulk emails from NSF file to PDF, deploys to individual or groups for sending mails. Print Lotus Notes document to PDF is an easy to carry out processing because of usage of fast functionalities. If I have to made more than one PDF file to store NSF mail then is it possible? Sure, you can convert NSF mails into more than one PDF file even the flexibility of software allows to convert each mail per PDF. Is it true that the software provide the Scanning Procedure? Yes Off course, software will definitely provide the Scan Procedure just to serve you the error free and threat free data after conversion. Can I convert my whole data in once? Yes, software will provide the bulk conversion of entire mailbox of Lotus Notes like inbox, sent items, Outbox and Draft in to Adobe PDF format in once. What are the specifications of Demo Version? Demo version will work same as Full Edition so user can check all the Features of software and can convert 10 emails freely from Lotus Notes message to PDF. Will this software is able to preserve Meta data? Yes, software will not harm any content of Mail database like it convert HTML format, Links, Graphics and Attachments into PDF format. Copyright © 2007-2017 www.lotusnotestopdf.net | All Rights Reserved.